Here is another article in my series of How to Hack MySpace, where I’ll show case various tips, tricks and method to hack MySpace Profiles, friends etc and customise and make it more applealing to get more friends. 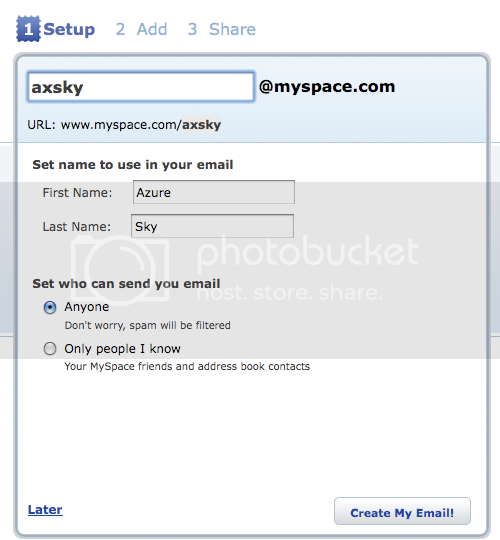 If you have signed up for MySpace there is a little less know featured its called the MySpace Vanity Url. Basically this hack for MySpace profile lets you get a good looking URL for you MySpace Profile so that your friends and family can easily remember your MySpace Profile without the need to remember those funny looking numbers for the Profile or the need to bookmark the Profile Page. This way you can easily connect with your friends and family. Below I have outlined step by step on how to use this Hack for the Profile url. Step 1 : Goto MySpace.com and Login to your MySpace Account with your UserName and PassWord. Step 3 : Next you’ll be show a page which allows you to choose Your Myspace URL and Name, Enter the the Url of your choice into the boxes provided. 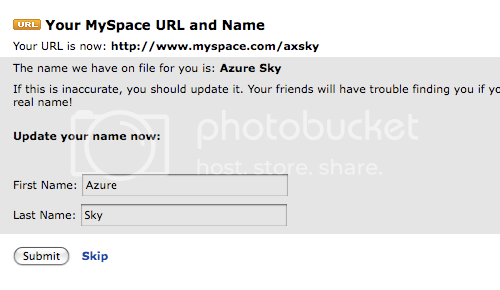 And Click Submit, You’ll get two confirmation alert boxes telling you that you can never change your MySpace URL. Once you clicked both the confirmation boxs if the name you chose is available you can go to the next step else you’ll have to repeat the steps. Step 5 : Thats it you have successfully hacked MySpace to get yourself a great looking Profile URL that you can now share with your friends. Just copy the Profile URL and send it to all your Friends. 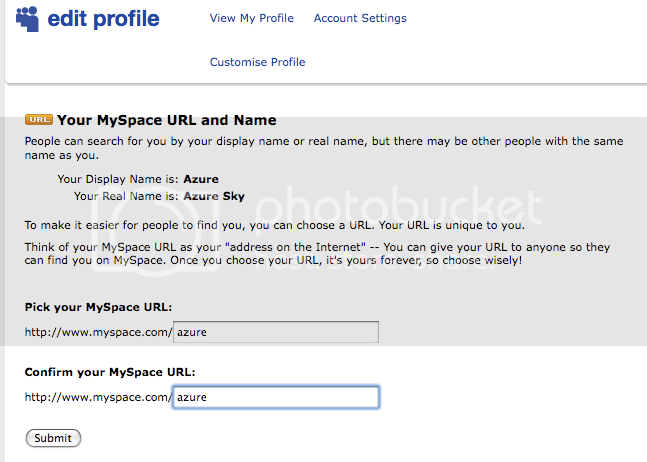 Step 1 : First Open your Browser type in MySpace.com now enter your UserName and Password to Login to your MySpace Account. On you Profile Page click the Mail Tab that you see on the top left corner. 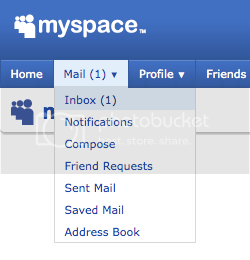 Step 2 : You’ll see a Welcome screen which says get your MySpace Email, and a Screen to choose your email ID. Enter a User name of your Choice this can be anything if the Email ID is available you can move to the next step. Step 3 : You’ll be asked to confirm your Email. Warning you cannot change your Email ID so choose carefully, since there is no way to hack or tip to change the ID. 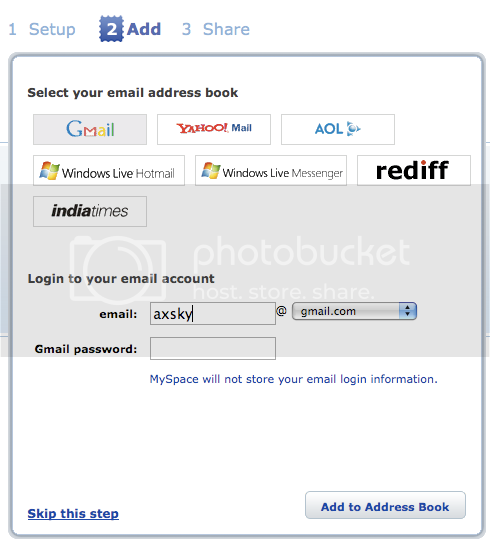 Step 4 : You can skip this step by clicking Skip or you can enter you Gmail, Yahoo, AOL, Hotmail, Live, Rediff, Or IndiaTimes Email ID and PassWord and let your friends know about the new MySpace Email address you just got. 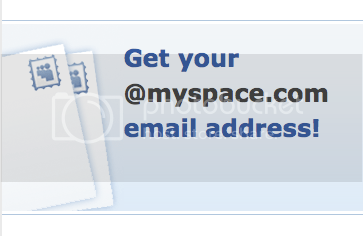 Step 6 : Now you can go to your new official MySpace Email Inbox, and a welcome mail from MySpace. 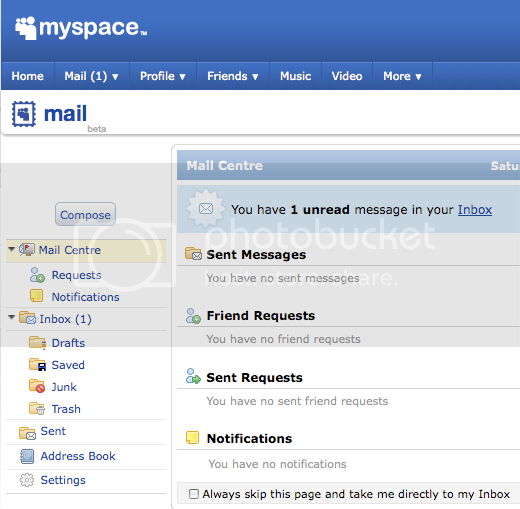 GO TO NEW MAIL AND MAKE A NEW MYSPACE ACCOUNT. THANKS AND YOUR WELCOME. I forgot my old password and e-mail and I reallly want this myspace back and see all the pictures; how do I do that ? hey SIS WATTS upp DISS IS HERR BROO HACKIN HER HAHA……………………………..